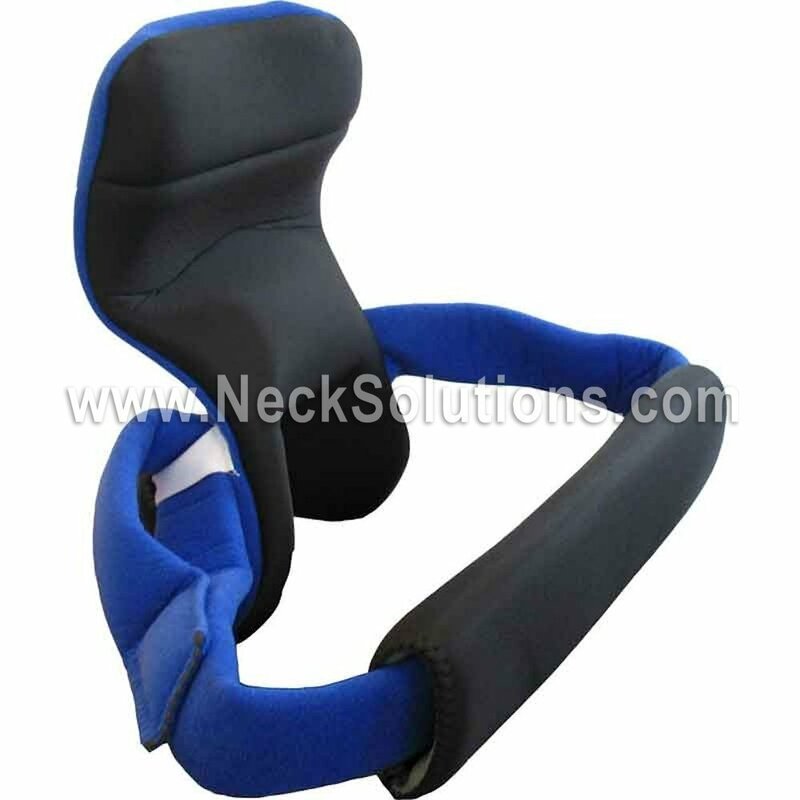 This is a restorative bracing device for management of neuromuscular conditions affecting head posture and neck muscles. 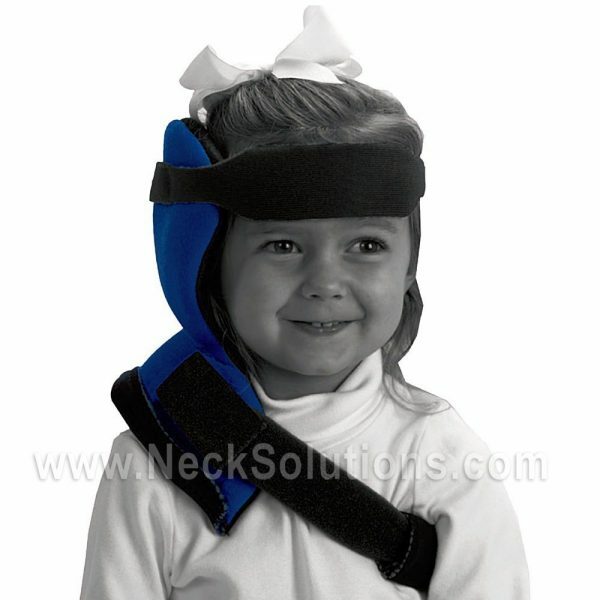 The Torticollis Brace is neuro-restorative, designed to help correct the condition in some individuals, while providing a solution for management to others. Insurance Code – L0113 It is recommended a professional measure and fit the brace. The brace requires heat molding for proper fitting. Single patient use only. No natural rubber latex or di-(2-ethylhexyl) phthalate. 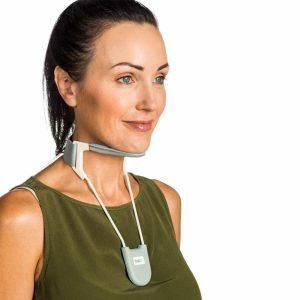 The neuro resorative medical brace permits a patient to be able to work with the muscle tone, achieve neuromuscular inhibition, thus achieving permanent lengthening and correction. This is the goal, however, everyone is different and, while this may not be possible in every case, this type of bracing can help as an adjunct to other physical therapy approaches and help to provide new hope. Measure from the top of the shoulder to the forehead at eye level, going back just above the ear. Have your therapist help with measuring, adjusting and compliance. You may need to compensate for any side deviation of the head. This may be accomplished by splitting the difference between the right and left side measurements, so length1 + length2, divided by 2. 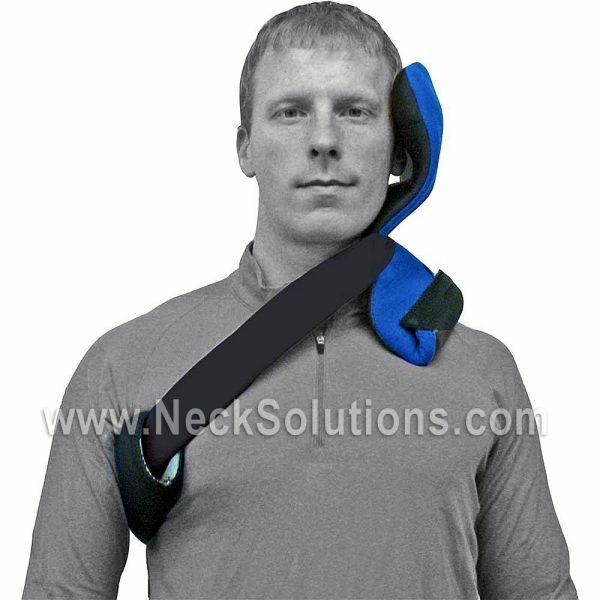 The design of the brace offers a low-load passive type of stretch to help increase the range of motion. It has the potential to safely and comfortably provide correction of the torticollis side tilting of the head and neck using a neurorestorative approach. This is the same principle as with our torticollis collar, regarding a corrective approach with adjustability. 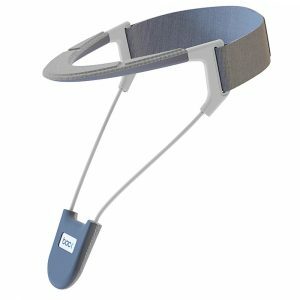 The brace permits relaxation of tension, while the insert can be molded for a gradual correction of neck posture. 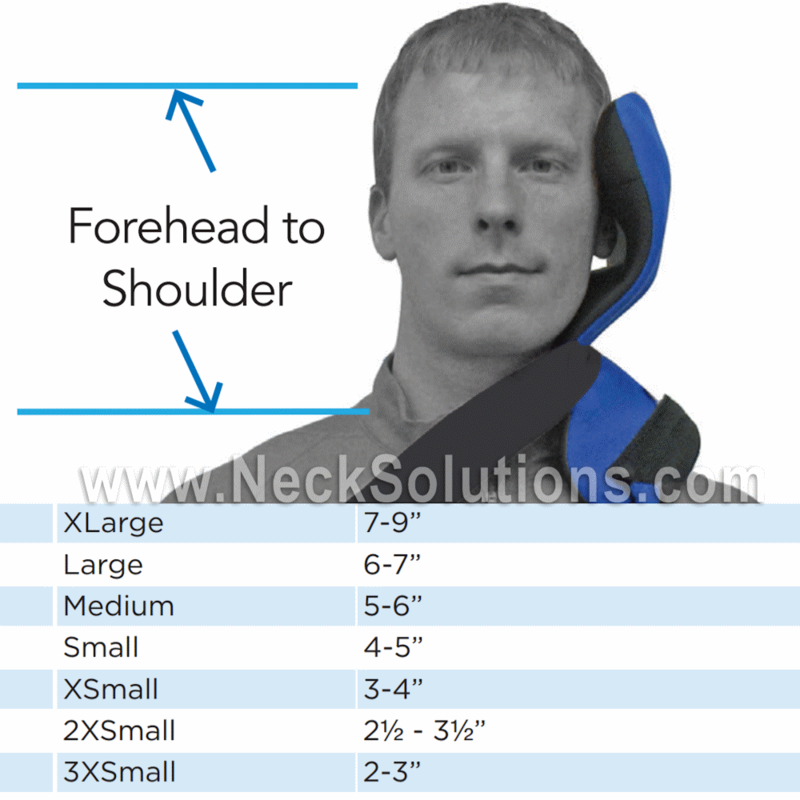 The brace is for left and right leaning that goes around the shoulder and provides a flex type resistance that allows the brace to absorb some of the spasticity, while providing a counter pressure. It is possible to see neuromuscular inhibition effects in about 15 minutes of use. Made in America, it provides a fulcrum for leverage against the head on the side of spasticity. By progressively molding the insert, you can adjust the brace as the condition improves, working towards gradual removal and maintenance use. 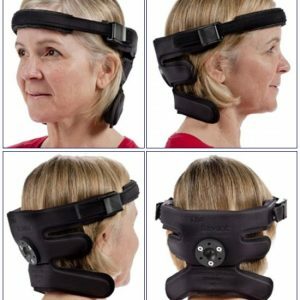 If your having problems keeping your patient in the brace; if their head is forward or they move a lot, you can order the headband or forehead strap. 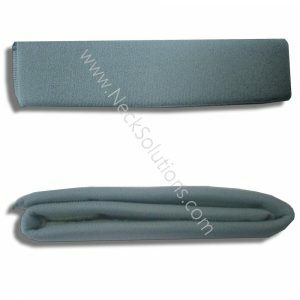 This can be attached using velcro at the required angle for each patient. 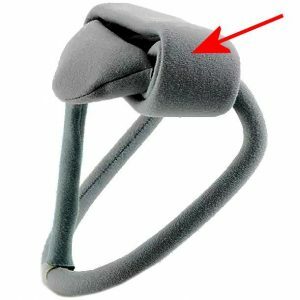 This can help keep the patient more snug in the brace, just make sure there are no pressure points and the it is secure and not dropping over the eyes or falling down. The insert is thermoplastic, which may be molded by heating for progressive re-shaping. It maintains a spring effect, similar to a fishing pole. The action of the pole permits pulling by the fish, allowing the pole to flex. This maintains flexible force for a sustained period until the fish relaxes. 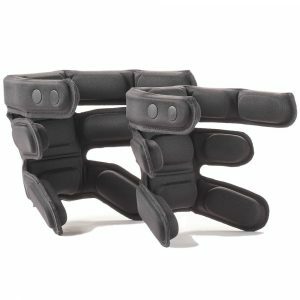 This brace is designed to relax muscle tone and lengthen short muscles. This is not a rigid orthosis, which provides a static position for conditions which require the body part or joint to be kept in a specific position in order to promote healing and/or facilitate function. 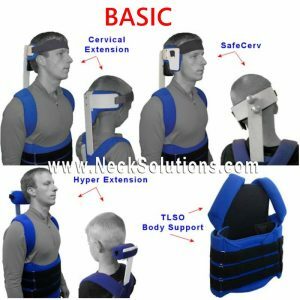 Torticollis is often a condition of neurological tone and the torticollis brace is a device that is applied in order to provide a slight stretch, yet permit the head and neck muscles to work through the tone, then bringing it back. By letting the brace work for about 15 minutes, muscle relaxation or inhibition can occur. After this process, it is possible to then determine if there is any actual tissue shortening underlying the condition. If there is spasticity or tone with this underlying shortened tissue, the tone needs to be worked through, after which a low loading passively applied stretch can help to re-lengthen the shortened muscle tissue. Apply initially for 30 minutes. Remove and check the skin for redness or breakdown. If skin integrity is compromised, discontinue use and contact your health professional. Otherwise, gradually increase wearing times to the duration recommended by your clinician to no more than 6 hours at a time. Wear times are suggested and should be discussed with your health professional.